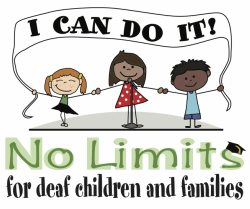 ​No Limits has started a grassroots effort to change public policy by educating people across the world about the struggles and triumphs of people with hearing loss through a national production and book entitled Silent NO MORE. The show has been performed across the countries with different cast members sharing their inspiring stories to sold-out audiences, including performances at the John F. Kennedy Center for Performing Arts and Carnegie Hall. Because of the desire to bridge the gap between the Deaf community and oral community, all productions have been followed by a Q&A session between the audience comprised of Deaf and oral individuals and the cast. These discussions have sparked a positive conversation about the needs of both communities and how to join efforts. This powerful production is revolutionizing the landscape of the field, helping individuals with hearing loss find their voice and a future with no limits. Check out some of the media coverage of the show below. ​your copy of Silent NO MORE today! Sharing my story in a future production. Hosting a production/screening of Silent NO MORE. Attending future productions of Silent NO MORE.